"Death is cruelty against the unsuspecting. But that's not what I perceive as cruel. Cruel is when you can't die even if you want to." Werner Herzog's Nosferatu: Phantom der Nacht is a remake of the silent F.W. Murnau classic, Nosferatu. The original was the subject of a plagiarism lawsuit by Bram Stoker's widow, and the lifted source material remains evident in this remake—the plot differs, but the characters of Jonathan Harker (Bruno Ganz), his wife Lucy (Isabelle Adjani), her friend Mina (Martje Grohmann), Renfield (Roland Topor), Doctor Van Helsing (Walter Ladengast) and Count Dracula (Klaus Kinski) are all familiar. Harker travels to Transylvania to arrange a real estate deal with the Count, who travels by ship to Harker's home town of Virna, decimating the crew and bringing the Black Plague with him. Herzog's take on the Dracula legend is a more serious, contemplative effort than most, aided immensely by a sympathetic performance by Klaus Kinski, who plays the Count as a pained, wretched creature desiring nothing more fervently than simple mortality. Kinski's makeup is inspired by Max Schreck's look in the Murnau film, with grayish flesh, warped, bat-like ears, a naked head, sunken eyes and extremely long fingernails; the effect is striking and communicates Dracula's otherworldly nature without obscuring Kinski's expressive eyes and face. The other performances are generally good—Isabelle Adjani shines as a beautiful, assertive Lucy, Walter Ladengast is a skeptical Van Helsing, and Roland Topor portrays Renfield as insane but employable. Herzog's photography is always gorgeous to look at, making fine compositional use of landscapes and architecture, and there are some memorable images, particularly a collection of mummies seen during the opening credits and shots of Dracula's furtive, survival-driven night forays. Nosferatu suffers most from a problem not of its own making—most viewers know the basic Dracula mythos so well that there are few surprises here, and the film's measured pacing exacerbates the potential for boredom. I don't consider myself a serious vampire buff, but I've seen enough of Dracula's various film and stage incarnations to know the characters and their general roles in the legend. While this makes it easier to appreciate Herzog and Kinski's collaborative artistry on a first viewing, it also makes it harder for the film to frighten or entertain in any immediate sense. Nosferatu is visually luscious, but emotionally rather empty—despite Kinski's excellent performance as the tortured vampire, the film seems slow, distant and oddly cold, a collection of evocative images without a compelling human element. Perhaps because Nosferatu was partly funded by Hollywood's 20th Century Fox, Herzog produced two versions of the film, shooting all dialogue scenes in both German and English to avoid the dubbing so often inflicted on "foreign" films. 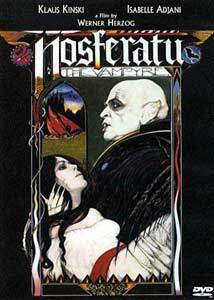 Anchor Bay's DVD includes the German version (with optional English subtitles) as well as the US release, titled Nosferatu the Vampyre—there are some minor performance differences between the two, but the film appears otherwise identical, running about ten seconds longer in English due to variations in dialogue timing. Image Transfer Review: Anchor Bay presents Nosferatu in its original 1.85:1 theatrical aspect ratio, with a non-anamorphic transfer. The fundamental image is good, with naturalistic colors and good shadow detail, and the source prints are in nice condition aside from a few single-frame "jumps" and some very minor dirt flecks. Unfortunately, the MPEG-2 compression falters from time to time—grainier scenes suffer a digital haze, bright details occasionally "float" within the rest of the frame, and one scene with smoke rising from a chimney pays less attention to the smoke than to the action in the lower part of the frame, actually reducing the smoke's frame rate and making its movement jerky and distracting. These are momentary problems, to be sure—most scenes look just fine with good detail despite the print's general softness, but it's too easy to play "spot the artifact" when the plot slows down, making this a below average transfer overall. Audio Transfer Review: Nosferatu is presented with three different soundtracks in two languages—the German version includes a Dolby Digital 5.1 remix as well as the original Dolby Digital 2.0 monophonic track, while the English version is presented only in 2.0 mono. The general character of all three tracks is similar—the 5.1 mix is extremely centered, using the other speakers only for some subtle music and ambient sound effects, with no significant LFE-level bass or dramatic envelopment. The digital transfer is generally clean, capturing the wind in Dracula's castle, fine orchestral/vocal score selections, the squeaking of rats and the scratchings of an unskilled young violinist, but Nosferatu's soundtrack is not its strong point, and the 5.1 remix brings little new to the table. Three theatrical trailers are included here, presented in a 1.85:1 aspect ratio with 2.0 monophonic audio. Two conventional US trailers are included, one for the English version and one for the German/subtitled version, as well as a great Spanish trailer which uses a montage of animated still images from the film and stylized color to good effect. Werner Herzog (prompted interview-style by Norman Hill) comments on the film's cultural origins, history and physical production, as well as his own career and goals as a filmmaker. Herzog speaks excellent English, and Hill keeps the screen-specific commentary going with no "dead space" - it's an informative and entertaining commentary. A thirteen-minute featurette shot on location during the filming of Nosferatu, with Werner Herzog discussing the film over clips from the production. A few sound bites from Klaus Kinski are also included. The footage is dated, soft and grainy with hissy audio, but it's an interesting mini-documentary that's not blatantly promotional. Nosferatu is an attractive, contemplative vampire tale with a touching lead performance by Klaus Kinski as Count Dracula. Anchor Bay's DVD transfer is flawed but watchable, with good supplements and both the German and English versions included. Vampire fans and film buffs will appreciate Werner Herzog's stately, serious take on the subject, though general audiences may find the film's pacing more deadly than its villain.